In hands-on testing, Principled Technologies (PT) found that the Dell Chromebook 5190 survived more hinge cycles and more micro-drops than the HP Chromebook 11 G6 EE and the Lenovo 100e Chromebook. Durham, NC, January 18, 2019 — Many school systems are opting for Chromebooks in their classrooms. More durable Chromebooks can offer a better investment by potentially alleviating repair and replacement expenditures. PT put three Chromebooks—a Dell Chromebook 5190, an HP Chromebook 11 G6EE, and a Lenovo 100e Chromebook—through a series of durability tests featuring hinge cycles (opening and closing the devices) and micro-drops (from about four inches high). These are common things that students do to their Chromebooks throughout the school day. 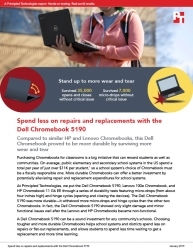 To learn more about how school systems can avoid extensive repair and replacement costs by choosing the more durable Dell Chromebook 5190, read the full report at http://facts.pt/5wmb21h.